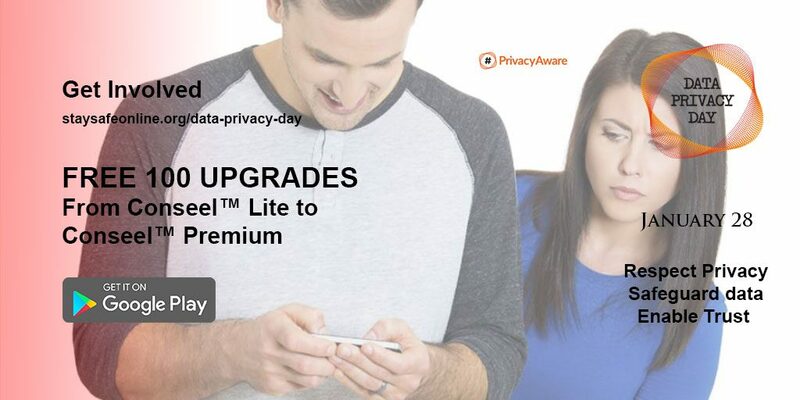 To increase awareness of Data Privacy Day 2018, we are giving away FREE upgrades from Conseel™ Lite to Conseel™ Premium version to the first 100 people who install and register within the app over the Data Privacy Day weekend (12:01 AM ET January 27, 2018 to 11:59 pm ET January 28, 2018). See below for the official Giveaway rules. NO PURCHASE NECESSARY. The “Conseel™ Data Privacy Day” Giveaway (the “Giveaway”) is sponsored by NYSNYD Inc. (the “Sponsor”). The Giveaway begins at 12:00:01 AM Eastern Time (“ET”) on January 27, 2018 and ends at 11:59:59 PM ET on Sunday, January 28, 2018 (the “Giveaway Period”). ELIGIBILITY: To enter the Giveaway, you must be at least the age of majority in the Country, State, Province or Territory in which you reside and not be an employee of the Sponsor, its affiliated companies or agents, their respective advertising or promotional agencies, its media sponsors, or third parties engaged by the Sponsor to assist it in administering the Giveaway or be a member of any such employee’s immediate family (regardless of where they live) or persons with whom they are domiciled (whether related to the employee or not). In these Rules, “immediate family” includes mother, father, brothers, sisters, sons, daughters, including the ‘step’ form of each of the foregoing, partner and/or spouse. The Sponsor shall have the right at any time to require proof of identity and/or eligibility to participate in the Giveaway. Failure to provide such proof may result in disqualification. All personal and other information requested by and supplied to the Sponsor for the purpose of the Giveaway must be truthful, complete, accurate and in no way misleading. Sponsor reserves the right, in its sole discretion, to disqualify any entrant should such an entrant at any stage supply untruthful, incomplete, inaccurate or misleading personal details and/or information. HOW TO ENTER THE CONTEST: To enter the Giveaway, install Conseel™ Lite application (the “app”) for FREE from the Google Playstore (https://play.google.com/store/apps/details?id=com.app.conseelapp ) and complete the registration process from within the app (the “REGISTRATION”) with your full name, date of birth, valid email address, password (if not registering using Google ID), your gender and Primary use of the app. You may also enter the Giveaway by signing up to receive Conseel’s Security Newsletter on https://conseel.com/dataprivacyday/ and completing the signup process with your email address and your Full name and you must click on the link within the confirmation email to be considered your Registration complete. If the REGISTRATION is completed within the Giveaway Period, the entry will be accepted as an eligible entry. Any entry that the Sponsor and/or its designated representative(s) deems, in its/their sole discretion, to violate the terms and conditions set forth in these Rules will not be entered.You may use only one (1) email address per person to enter the Giveaway. In the event it is determined that an entrant has entered in a manner not sanctioned by these Rules and/or has submitted more than the number of entries permitted by these Rules, the entrant will be disqualified and all of the entries submitted by the entrant will be disqualified. Entries must be received on or before 11:59:59 PM ET on January 28, 2018 (the “Giveaway Closing Date”) or will be void. The Sponsor, in its sole discretion, reserves the right to terminate the Giveaway or extend the Giveaway period, if an insufficient number of eligible entries are received.If a selected prize winner does not meet the criteria to enter Giveaway, Sponsor will select another entrant, whose entry complies with the criteria, to be declared a winner. Each entry is subject to the approval of the Sponsor and must satisfy all the requirements set out above and be submitted in accordance with these Rules. PRIZES: There will be one hundred (100) prizes to be won consisting of a promo code to upgrade Conseel™ Lite to Conseel™ Premium version having a manufacturer’s suggested retail price (“MSRP”) of $6.99 USD per promo code. The promo codes will expire on midnight of March 30, 2018. The promo codes are unique and cannot be shared. The promo codes will be emailed to the winners. These codes are to redeemed towards the upgrade of Conseel™ Premium from Conseel™ Lite.A prize must be accepted as awarded without substitution, is not transferable, assignable, not for resale and has no cash surrender value (in whole or in part). Fulfillment of a prize is based on availability and the Sponsor reserves the right, in the event that a prize cannot be awarded as described for any reason, to substitute another prize of equal or greater value, without liability. Any costs or expenses associated with a prize, including, but not limited to, installation of a prize will be the responsibility of the winner. .
DISTRIBUTION OF PRIZES: The first one hundred (100) eligible entrants will be selected for the Prize based on the date and time stamp of the Registration in our system(s). The clock starts on 12:00:01 AM Eastern Time (“ET”) on January 27, 2018 and ends at 11:59:59 PM ET on Sunday, January 28, 2018 . Odds of being selected depend on the total number of eligible entries received and how fast entries are registerd. The first 100 eligible entrants will be selected on January 30, 2018. All Prizes will be distributed on February 15, 2018. SELECTION PROCESS: The selected entrants will be notified by email within five (5) business days of the draw. If the selected entrant (a) cannot be reached by email within four (4) business days of being contacted; or (b) if selected to win the prize, fails to return the properly executed Release Form within the specified time (see rule 6), then he/she will be disqualified and another entrant will be selected by the same process until such time as a winner is determined or there are no more eligible entries, whichever comes first. The Sponsor will not be responsible for failed attempts to contact a selected entrant. In order to win a prize, the selected entrant must have correctly answered, unaided, a mathematical skill-testing question set out at the time of returning a Release Form to the Sponsor. The selected entrant will also be required to sign a form of Declaration and Release (the “Release Form”) or otherwise confirm compliance with the Rules, acceptance of the prize as awarded, without substitution, and release the Sponsor, its dealers, agents, affiliated and related companies, advertising and promotional agencies, the independent judging organization and their respective shareholders, directors, officers, employees, agents, dealers, representatives, successors and assigns (collectively, the “Releasees”) from any liability arising out of or in any way connected with the operation of this Giveaway and use of a prize. A prize winner assumes all liability for any injury or damage caused, or claimed to be caused, by participation in this Giveaway or use or redemption of the prize and from and against any and all claims based on publicity rights, defamation, invasion of privacy, copyright infringement, trade-mark infringement or any other intellectual property related cause of action that relate in any way to the Entry. The Release Form must be returned within the time period specified on the Release Form or the prize may be forfeited. Upon receipt of the completed Release Form, the Sponsor, or its representative, will inform winner of details related to how the winner will receive the prize. The Releasees shall not be liable for any damages caused or alleged to be caused by or resulting from any entry, prize or other correspondence or data that is lost, stolen, late, garbled, distorted, delayed, damaged or misdirected for any reason, including but not limited to: (i) any failure, interruption, technical malfunction or delay; (ii) any e-mail, text or other communication sent or received to or from the Sponsor or any of its agents or designees, for any reason; (iii) for any incorrect, untimely or inaccurate information, whether caused by the web site where this Giveaway was featured, users or by equipment or programming errors associated with or utilized in the Giveaway; (iv) any technical or human error which may occur in the processing of any entry or entries in the Giveaway; for problems with the function of any website or website feature, howsoever caused; (v) the malfunction of, or damage caused to, any telephone network or lines, computer equipment, data, software, online systems, servers or access providers; (vi) any functionality lost due to not having cookies enabled; (vii) for traffic congestion on the Internet; (viii) the security or privacy of information transmitted via computer networks; (ix) breaches of privacy due to interference by third party computer “hackers” or for any damage caused to or incurred by any entrant or any other person by reason of any such event or occurrence; or (x) technical, hardware or software failures of any kind, lost or unavailable network connections, failed, incomplete, garbled or delayed computer transmissions including lost, misappropriated or corrupted entries, virus, worm or Trojan Horse damage or any other damage which may limit a participant’s ability to participate in the Giveaway. By entering the Giveaway, each winning entrant hereby grants to the Sponsor the unlimited right (but not the obligation) to publish and use, without payment or other compensation and without notice, consent or approval, his/her name, photograph and likeness, address (city/town, state, province or territory), voice, and the whole or part of any statement or statements he/she has made or makes about the Giveaway or Prize awarded in any publicity, program or advertising, without geographic limit and in perpetuity, in any medium now known or hereafter devised (including, without limitation, the Internet), and hereby consents unconditionally to any such publication or use without further notice, consent, approval or compensation. The Sponsor reserves the right to disqualify any individual that it finds to be violating these Rules or tampering with the entry process. The Sponsor reserves the right to refuse an entry from a person whose eligibility is in question or who has been disqualified or is otherwise ineligible to enter. Any attempt by anyone to deliberately undermine the legitimate operation of this promotion may be in violation of criminal and civil laws and the Sponsor reserves the right to seek damages or other legal remedy to the fullest extent permitted by law. The Sponsor reserves the right to terminate the Giveaway, suspend the Giveaway or to amend these Rules at any time without notice if any factor interferes with the proper conduct of the contest as contemplated by these official Rules. The Sponsor is not responsible for printing, distribution or production errors. Entry material/data that have been tampered with or altered are void. The use of an invalid email address will disqualify the entry. Users spamming the same email address will disqualify the entry. In the event of a dispute, entries will be deemed to have been submitted by the authorized account holder (defined below) of the email address submitted at the time of entry. “Authorized account holder” is defined as the person who is: (a) assigned an email address by an internet provider, online service provider, or other organization (e.g. business, educational institute, etc.) that is responsible for assigning email addresses for the domain associated with the submitted email address with the selected entry. If the identity of an entrant is disputed, the authorized account holder associated with the email account at the time of entry will be deemed to be the entrant. A selected entrant may be required to provide proof that he/she is the authorized account holder of the email address. The sole determinant of the time for the purposes of a valid entry in this Giveaway will be the contest server machine(s). The Sponsor reserves the right to cancel, suspend or extend this Giveaway or change these Rules for any reason, at any time, at its sole discretion, without notice to participants, including but not limited to lack of entrants, a virus, bug or other cause beyond the reasonable control of the Sponsor corrupting the security or proper administration of the Giveaway. All entries become the permanent property of the Sponsor and none will be returned. No correspondence will be entered into, except with the selected entrant. The Giveaway is subject to all applicable Canadian federal, provincial and local laws and regulations. This Giveaway is VOID WHERE PROHIBITED BY LAW.